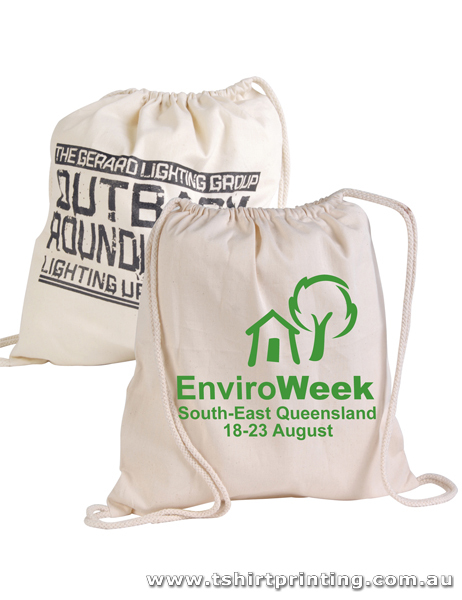 Imprinting your company name/logo on calico or tote bags is one of the coolest ways to promote your business. Eco-friendliness is a huge factor in drawing people to your brand. Take the example of Apple: their products cost twice as much those offered by competitors. Still, people flock to buy Apple products as they are marketed as being environmentally friendly. We all know plastics are an environmental hazard. So shopping with a reusable calico shopping bag, could save millions of plastic shopping bags entering our waterways and ocean. So you would agree, they are totally environmentally sustainable. And people love to use them, which makes them great promotional items. Even if you give away just a couple hundred of recycled shopping bags in one promotional event, you can get your name around a small town in pretty quick time. Tote bags offer much better coverage and visibility than pens or even pamphlets and banners. A banner simply advertises your business in a blatant, straightforward fashion. Sure, it gives you decent visibility but it does nothing to compel people to buy your products or services. However, when you gift people calico bags with your emblem, you create a friendly bond with them – people begin to perceive your company in good light. The bags remind people of your company every time they go out shopping. Thus, they are much more likely to patronise your business. Also, the bags become a sort of mobile advertisement for your brand; other people see your business logo on multiple bags all across town and end up giving you a call or googling you! Be Selective With Your Give-aways. You do not necessarily have to give away shopping bags to random people – you can reach out to your target audience by using just a little bit of resourcefulness. If your business is manufacturing children's toys, arrange a give-away event next to a popular park, school or the kids’ section of a mall. If your company offers catering services, hold a promotional event at the local farmer’s market. If your business is car repairs, go to car shows, motoring events and talk to the car dealers around town. A company that cares about the environment and sustainability is considered to be reliable, desirable and trustworthy. It is the reason people visit eco-friendly resorts – even though they are incredibly expensive. It is also the reason why some people choose to drive electric cars, despite the fact that they are ridiculously impractical. Do you want to do your bit for the environment? Do you want people to associate your company with reliability and efficiency? If yes, tote bags are the answer for you. They make a great impression on people. You can find a wide range of calico/tote bags on our website. Our collection is one of the most elaborate in Australia. We also have a bunch of other promotional products that you will surely find interesting. All our promotional products are of an extremely high quality. Moreover, they are priced competitively and offer plenty of scope for customisation. We go to great lengths to ensure that our customers are totally satisfied. We know that our business thrives only when our customers’ businesses do well! We are highly experienced in helping companies organise promotional campaigns. Feel free to approach us even if you are totally new to this concept. We will get you started on the right track. Our highest priority is to protect the environment and to aid in maximising the growth of your business. We are very happy with the product! Hi Bec! Yes definitely good news � even better � we already received them! In the end we are very happy with the product, they look great. Thank you for your help.